With an opportunity like this, of course I said YES! We flew out from Boston to LA and then on to Seoul! 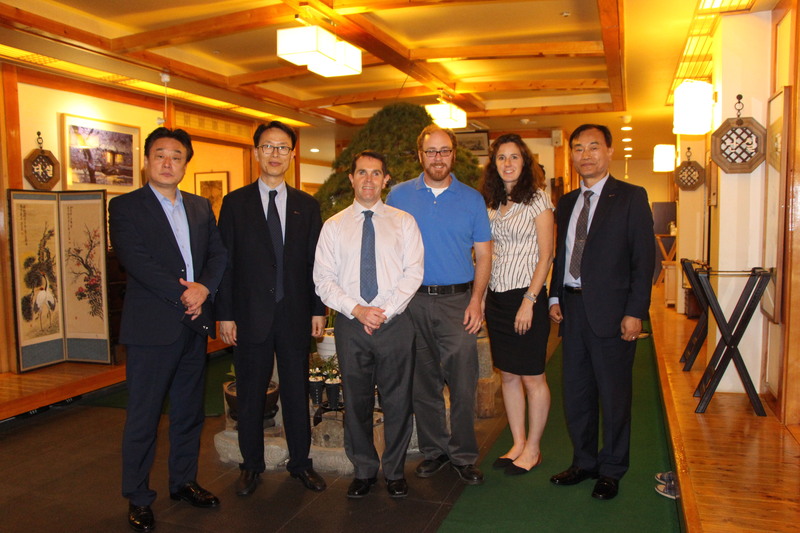 Upon arriving we met with our interpreters and tour guides, Calvin Lee and Lauren Park. I have to say, a huge highlight of the trip was spending time with Calvin and Lauren, who took us anywhere we wanted to go and were up for all of our adventures! Our hosts ensured we received the best of the best, including our accommodations. We stayed at the Olympic Park Hotel in the southern part of Seoul, close to the Gangnam District (yes, like that “Gangnam Style” song that’s still stuck in my head). After a quick settling in, we headed to a traditional Korean lunch and met with K-Sports Foundation’s HyunShik Jung, DongChun Chung, and Ji Gon Kang as well as fellow presenter Mike Lloyd from New Zealand, founder of The Blind Sport Podcast (which Kyle actually appeared on late last year – small world!). Next up: conference day! 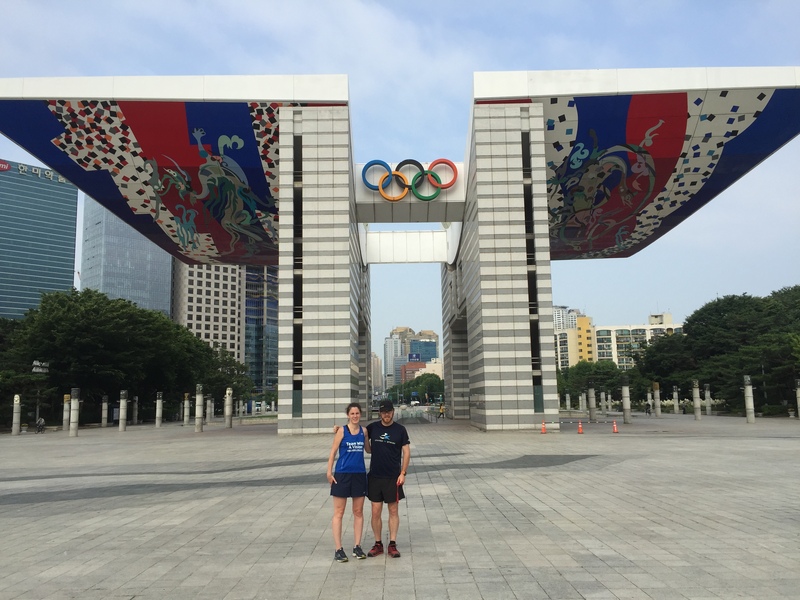 Despite being a big day, Kyle and I took advantage of the morning and our tour guide’s previous track experience by having him run with us through the hotel’s back yard, Olympic Park! Olympic Park was built in 1986 to host the Asian Games, and in 1988 it was where Seoul hosted the Summer Olympics. We looped around the park for a total of 5 miles, taking in the Outdoor Sculpture Park, live competitive badminton games (players paused to say “Hi” and show off! ), the World Peace Gate Eternal Flame, and the Olympic Exhibition Halls. And now it was time for the main event – the conference itself. Jung Dong Choon, President of K-Sports Foundation, spoke first, welcoming guests and speaking on the importance of a conference of this nature. 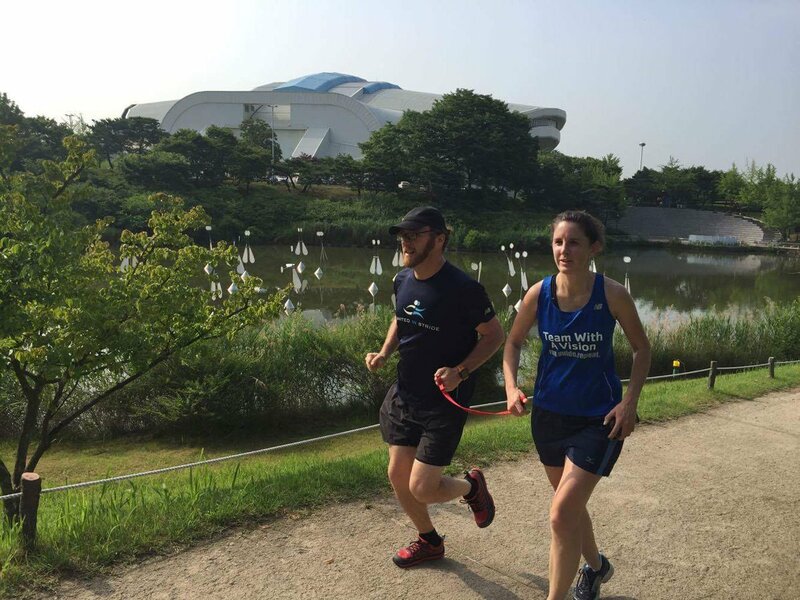 Guide running is a fairly new concept in South Korea, and the K-Sports Foundation hopes to raise awareness to increase the participation of athletes who are blind and visually impaired not just in running, but skiing and other sports on both a competitive and recreational level. The conference was attended by professionals working in the field of fitness/athletics, including Mr. Kim Young Soo, the Director General of Sports Cooperation Bureau, Sports Policy Office at Ministry of Culture, Sports and Tourism, and Mr. Oh Gwang Jin, the President of Korean Society of Adapted Physical Activity and Exercise. Kyle was featured on the event poster! By bringing together so many leaders in the field, K-Sports Foundation laid the groundwork for a thoughtful conversation about the increased participation of guide runners, the concept of guides being elevated to a professional status, a more streamlined training process, and countries coming together with a unified ideology of training and recruitment for guides. Tied together under the theme, “Sport Together, Happiness of All” it was truly an inspiring conference! For our presentation, Kyle and I spoke about MABVI’s work in sighted guides programs. Our mission was to convey what we, in our experience, have found to be the key components of a strong and sustainable program, including recruitment, training, matching, and support. 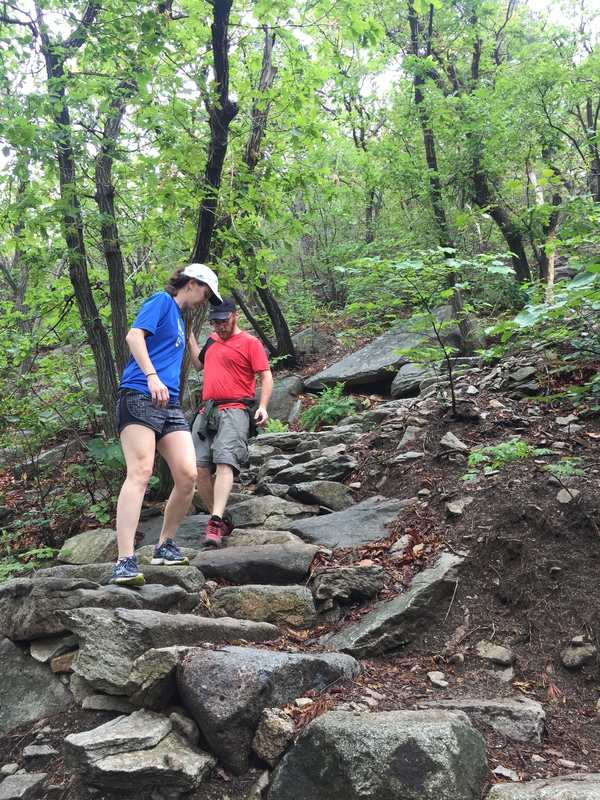 We included details such as ideal ratios of volunteers to staff and sighted guides to runners, what to look for when recruiting volunteer sighted guides, and what criteria helps in making a successful match. 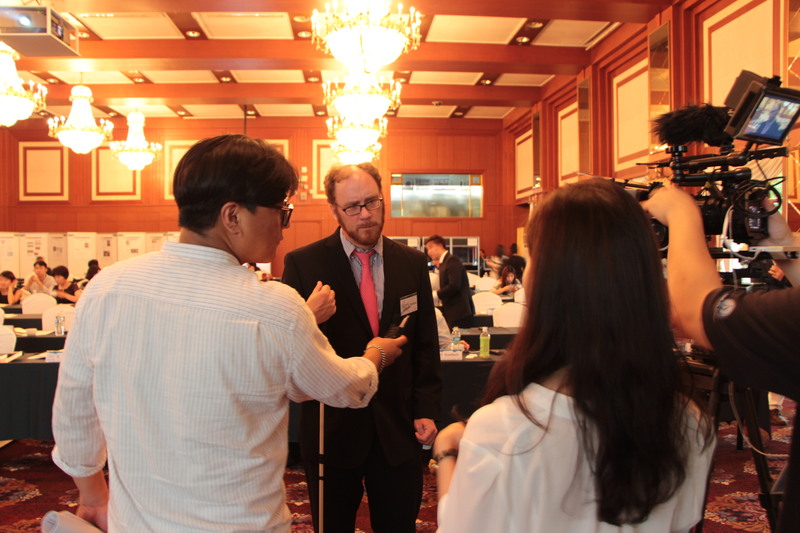 After the presentations, Kyle sat on a panel for a question and answer portion and was interviewed on camera for K-Sports. We then headed up to a viewing of a traditional Korean Martial Arts Ceremony. It was breathtaking to see these highly skilled individuals (including a woman, yay!) with such focus, poise, and athleticism perform acrobatics, dynamic high kicks and back flips, and even breaking wood blocks – needless to say there were lots of oohs and ahhs in the room! 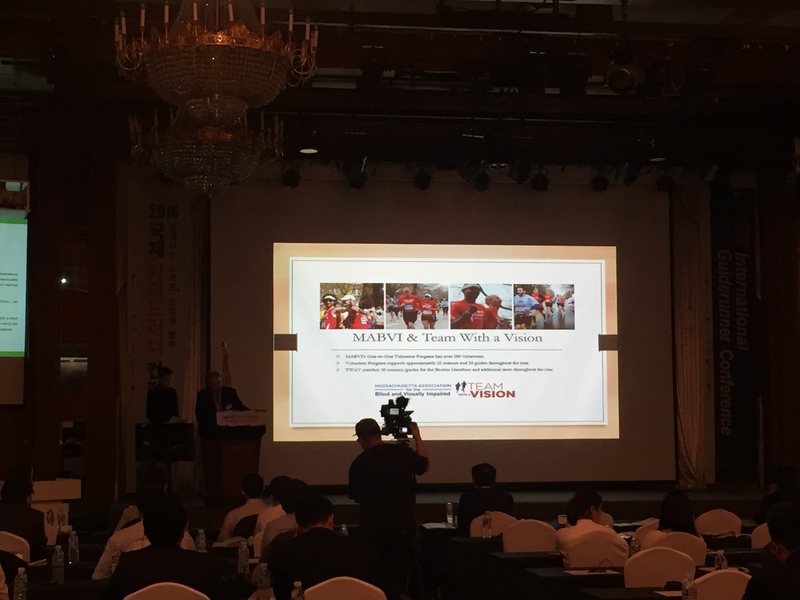 K-Sports Foundation President Jung Dong Choon followed the Martial Arts Ceremony with a presentation on implementing a World Guiderunner Federation (WGF). 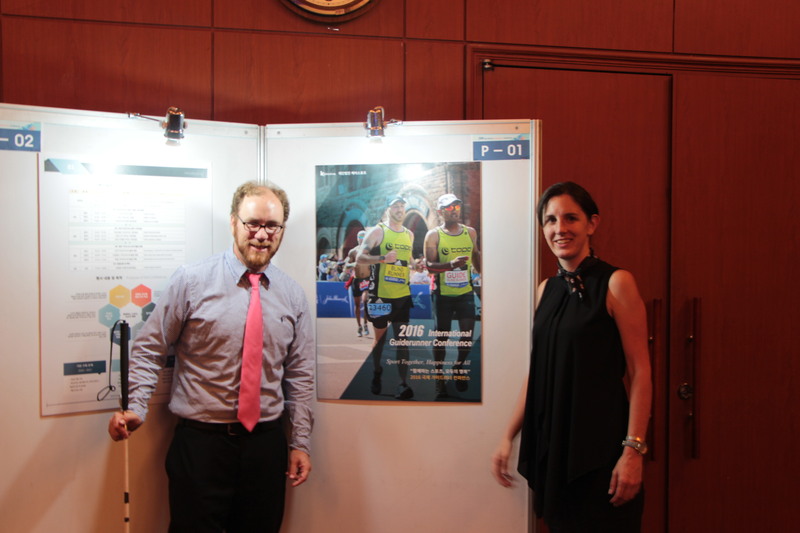 Through this, K-Sports Foundation hopes to join together organizations across the globe to create international standards through a certification process for each guide runner and a vocational school to establish relevant laws and regulations. By creating a streamlined process across the globe, K-Sports Foundation would endeavor to close the gap between athletes with disabilities and guides. After a traditional Korean dinner, we spent some time lounging at the local 7-11 (no, seriously) and chatting with our fellow presenters Mike Lloyd and Ralf Rombach, coach for the Nordic Paraski Team in Germany, before calling it a night. 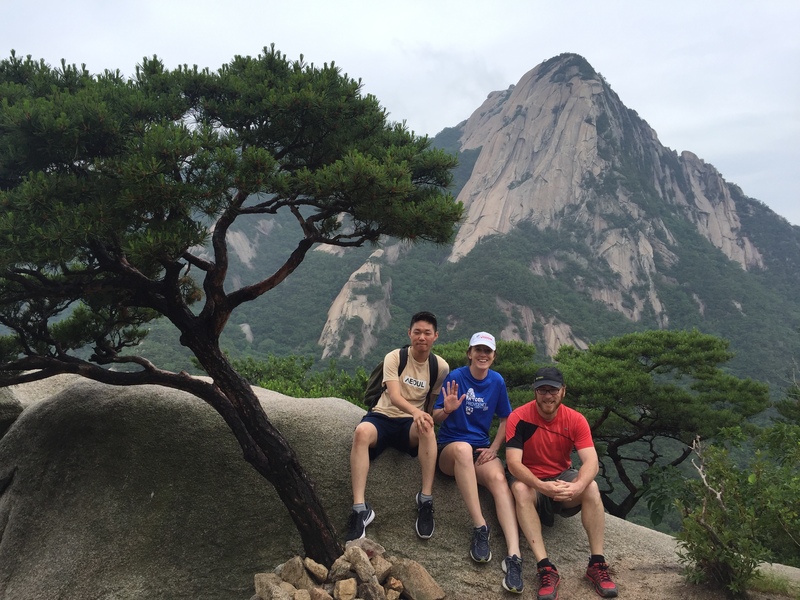 Friday morning, before our 17-hour flight home, Kyle, myself, and our tour guide Calvin took on the lofty challenge of climbing a peak at the Bukhansan National Park. My motto, “I’m always up for an adventure” was really tested on this outing, as this was the most technical climb I had ever done! Once we got to the top, the views were breathtaking, as you could see most of Seoul and the higher peaks that surrounded us! 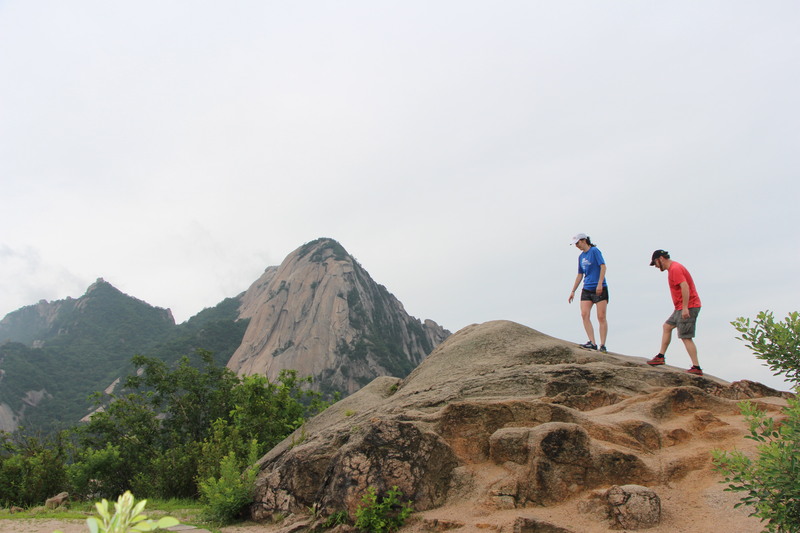 Kyle and I reaching one of the peaks at Bukhansan National Park – such a beautiful place! Post-hike, we decided to head to Insadong, a must-see for Seoul tourists – plus I’ve been assured that even locals hang out for the cool cafes, museum, food, and art! There we had a casual lunch of bulgogi with lettuce wraps, bimbimbap, and makgeoli. 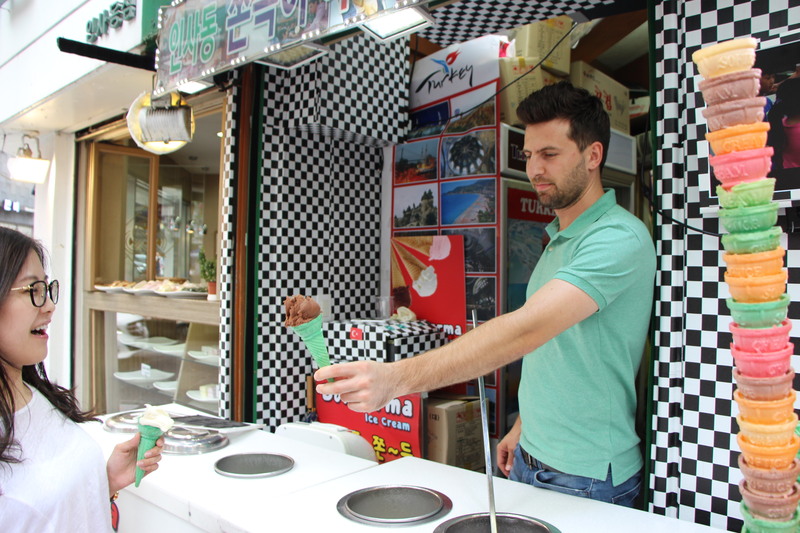 My sweet tooth radar took hold and we soon found some Turkish ice cream from a street vendor, so yummy! After purchasing a few souvenirs (I’ve got a new favorite brooch from Kong Kongy! ), we headed back to the hotel to grab our belongings and begin the journey back to Boston! Now was the time to say goodbye to our companions and new friends, Calvin and Lauren. There really are no words to sum up how awesome and supportive they both were on our journey. They were up for anything, having us try new foods, explaining the culture and history behind the dishes and traditions (Did you know it’s considered rude to eat the last bite on the plate? ), helping to translate, navigate where we needed to go, and just overall being a positive part of the experience! They are the chocolate in my chocolate chip cookie (Can’t help my food references!). 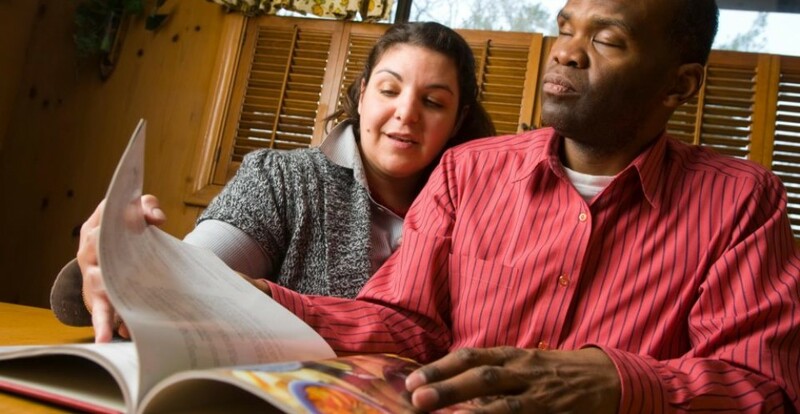 Interested in being a sighted guide, or seeking a guide for yourself? Sign up for United in Stride at unitedinstride.com. To learn more about MABVI’s Volunteer Program, visit mabvi.org/volunteer or contact Kyle Robidoux. To learn more about Team With A Vision, visit mabvi.org/teamwithavision or contact Andrea Croak. This entry was posted in Running, Travel, Traveling, Uncategorized and tagged Andrea Croak, blind, Blindness, Boston, Boston Marathon, Disability, Guide running, Health, K-Sports, Korea, kyle robidoux, Low vision, MABVI, massachusetts association for the blind and visually impaired, running, Seoul, sighted guide, Team With A Vision, TWAV, United in Stride, vision impairment, Vision Loss, Visual impairment, Visually Impaired, volunteer, volunteer for the blind, Volunteering by mabvi. Bookmark the permalink.